There’s existing, and then, there’s living. 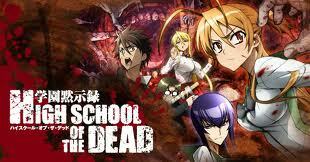 “High School of the Dead,” adapted from a manga of the same name, is a Japanese take on Romero style zombie movies, down to the open homage in episode titles (featuring English and the word DEAD in capital letters). Homage to Romero style zombie movies means, by the way, we’re talking slow zombies, not the “fast zombies” of “28 Days Later” type films, just so you know. Anyway, the real theme of this show, I think, is passion. It’s not just about staying alive, as massively difficult as that is in a zombie apocalypse. It is about staying alive spiritually as well as physically, retaining humanity in a world gone mad and inhuman. This is exemplified when the leading male of the team makes an individual decision, followed by the others, to rescue a little girl whose father dies at the hands of fellow humans while trying to get people in a house to open the door to save the little girl. (He gets shot with a shotgun, and the girl’s cries call the sound-following (albeit blind) zombies near.) This isn’t because it brings any advantage; it’s because it’s the right thing to do. The irony of the situation is that, while there’s terrible situations where the heroes are on the defensive, the leading male’s thoughts to himself confirm what seems apparent to the viewer: when he is on the attack, with the odds against him and nothing before him but striking down his foes, escaping horrible death at every moment, it is at this time that he feels more alive than at any other time in his life. The opening theme is sung with immense passion. Ultimately, it’s not about “winning,” nor is it about “survival”; it is about retaining humanity or even, one might say, living more humanly than people in less horrific circumstances might manage to do. As in the best traditions, zombies are metaphors. We can go through life as if we, too, are lifeless, or we can embrace a love of life, resisting the forces of entropy and sameness. …Anyway, not to make too grand a thing out of it, this is the basic theme. Animation is certainly high quality. Action choreography and sound and so forth are all not bad at all; when the action is good, it’s very good to see. Nonetheless, please understand this is escapist fantasy, so don’t try everything you see here in the event of a real zombie apocalypse. Your mileage may vary, that’s all. Anyway, the largest complaint that can be launched – with some legitimacy – is that the fan service actually distracts from good action. This is a show for mature, jaded viewers who are cool with something that is just a pure ride, pure entertainment. The level of gore and fan service is absolutely not for kids. It is therefore for the young adult, the experienced movie-goer, the person who wants something edgy and new without losing itself in either of those things. Bottom line: It’s extremely entertaining, as long as the viewer is suited to the material. In all seriousness, if your average zombie movie was as entertaining as a random High School of the Dead episode, I might watch them. As it is, I’ll stick to the anime. (Well, I might read the manga later.) It’s a wild ride, but I find it well worth it because, well, I fit the “mature, jaded viewer” category just fine. Not everyone does. If you don’t, don’t force yourself. This show knows its target audience and flaunts both its virtues and vices. Namely, if gore and fan service bother you, stay away! This entry was posted in Anime, Culture, Japan and tagged anime, culture, high school, Japan, zombies. Bookmark the permalink.